Glaucoma is a condition in which irreversible vision loss occurs due to damaged optic nerve fibers. These fibers are thought to be damaged by increased pressure within the eye. Everyone has a normal eye pressure level determined by the flow of fluid throughout the eye. This pressure maintains the shape and function of the eyeball. If there is overproduction and/or insufficient drainage of fluid, glaucoma can occur. Glaucoma can be a gradual, progressive disease, or it can be a quick and sudden process. Some people may experience blurred vision, distorted vision, compromised peripheral vision, or vision loss. However, glaucoma typically has no symptoms in its early stages. More than 3 million Americans have glaucoma, but only half are aware they do. Scheduling regular comprehensive eye exams that check for glaucoma is essential to long-term vision health. Eating foods high in certain antioxidants and taking supplements helps, too. Every patient is monitored for glaucoma. Patients with specific risk factors may have additional tests run to fully assess. How do we test for glaucoma? 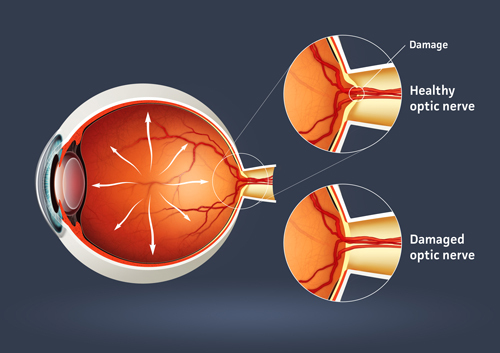 The damage caused by glaucoma cannot be reversed. But proper diagnosis, treatment, and monitoring, can help slow or prevent vision loss, especially if the disease is caught in its early stages. The goal of glaucoma treatment is to lower pressure in your eye (intraocular pressure). Depending on your situation, options may include medication (eye drops, oral) or supplements, laser surgery, or conventional surgery. Additionally, some glaucoma procedures can be combined with cataract surgery if both are requiring treatment. Significant advances have been made in all of these modalities over the years, and our success rate in controlling the disease continues to increase. If eye drops are not sufficiently effective, our doctors may rarely need to prescribe an oral medication, typically a carbonic anhydrase inhibitor. Once you are taking medications for glaucoma, we will want to monitor you regularly. Carefully follow your medication regimen to preserve a healthy eye pressure and prevent vision loss. Trabeculoplasty – Option for open-angle glaucoma patients. Your eyes are numbed with drops, and a laser beam is used to open clogged channels in the trabecular (drainage) meshwork to improve fluid drainage. May reduce or eliminate the need to take medication. Iridotomy/Iridectomy – Option for closed or narrow-angle glaucoma patients. A laser creates a tiny hole in the iris which helps fluid flow to the drainage angle. May reduce or eliminate the need to take medication. Cycloablation – Option for open-angle glaucoma patients who did not experience resolution from more traditional treatments. The laser treats the ciliary body (the part of the eye that connects the iris to the choroid or layer of the eyeball) to reduce the amount of fluid production. May reduce or eliminate the need to take medications. Trabeculectomy – Option for both open-angle and closed-angle glaucoma. By creating an opening in the sclera (white of the eye) and removing part of the trabecular meshwork, fluid is allowed to drain through this newly created channel. May reduce or eliminate the need to take medication. Drainage implant – Several different devices have been developed to aid fluid drainage. Our surgeons insert a small drainage tube in your eye. It sends the fluid to a reservoir so it can be absorbed into nearby blood vessels. This surgery lowers pressure less than trabeculectomy. But it is preferred for patients whose pressure cannot be controlled via conventional surgery or who have previous scarring. 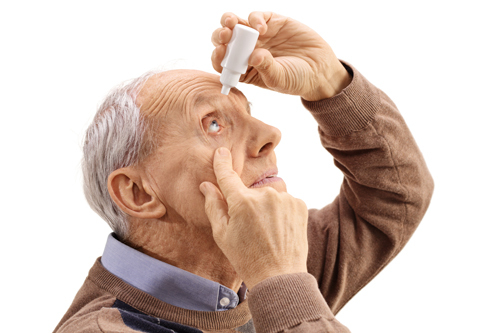 eye drops and who are ready for cataract surgery. This safe implant helps control your eye’s internal pressure. The doctor performs this procedure in conjunction with cataract extraction. Most patients are able to maintain normal eye pressure afterwards. iStent is typically covered by most private insurance companies as well as Medicare. If you have glaucoma and are preparing for cataract surgery, ask us if the iStent® could be right for you. Heart of America Eye Care doctors can determine if you have glaucoma.